Marketing proposals can make or break you. Good ones put you on the fast track to a lucrative business relationship. Mediocre ones end up discarded or ignored. As a marketer, it’s a frustrating dilemma to face. You can’t stop writing proposals because clients expect to see them. But churning out batch after batch of ineffective ones isn’t just demoralizing: it’s a huge waste of energy and time. Sick of submitting proposals and hearing crickets from your dream clients? Ready to make the most of your proposals and use them win over the marketing clients everyone wants to work with? Keep reading to see where most marketers go wrong… and how you can avoid their mistakes to write a marketing proposal that sells. As a marketing expert, how you present yourself to prospective clients is a direct reflection of your ability to do your job. There are a lot of talented marketers out there. Practically all of them are competing to work with a small pool of clients – people willing to pay premium rates for top-quality work. The clients everyone wants won’t entrust their business to someone who can’t even win them over in their proposals. If you can’t do that, how could you possibly win over their customers? Unfortunately, most marketers end up submitting proposals that make them invisible to this tier of clients. Proposals turn into a grind – a numbers game where “winning” means occasionally picking up a new client you didn’t really want to work with. So, why are so many marketers struggling with their proposals? It boils down to a combination of factors. Get just one of these wrong, and your proposal starts to look like every other generic proposal clogging up clients’ inboxes and cluttering their desks. If your proposal can’t hold prospective clients’ interest, they won’t spend the time it takes to develop a meaningful impression of you. Any potential business relationship dies off before it really begins. No one has time to wade through irrelevant details. Unfortunately, most marketing proposals are packed with them. This makes it easy for in-demand clients to weed them out; if a proposal doesn’t grab their attention right away and keep it, they trash it and move on to the next one. This is the key difference between your marketing agreements and proposals. One focuses on selling, while the other handles the terms and legal risks. Going on about your skills, accolades, and past achievements in an effort to impress clients is tempting. But it’s often the final nail in the coffin for many marketing proposals. An acknowledgement of the client’s unique needs. If marketers can’t even convey to a client that they understand the client’s situation in their proposals, how could they possibly do it for the client’s customers? Even armed with all the right information, marketing proposals won’t engage and persuade quality clients unless that information is packaged in a clear, logical way. What should I talk about in my proposals? How do a tie everything together in a way that makes sense? Understanding the answers to those questions will save you time and frustration. It will help streamline your proposals and make them more persuasive at the same time. So let’s start there. Once you get the basic structure of a winning proposal in place, you can flesh it out with key information why you’re the best choice to handle clients’ marketing needs. But you don’t need to start every proposal from scratch. The persuasion process is always the same. It doesn’t matter if you’re helping a local pizza place or a Fortune 500 tech company. A persuasive proposal structure helps you tap into the key drivers that get clients’ attention, keep them reading, and assure them you’re the best choice to help. Include these three key elements in your proposals, and you establish a solid foundation you can build on to win over all kinds of clients. The problem statement is probably the most critical element of any proposal. Failing to include one (or not including one at the beginning of your proposals) is a recipe for invisibility among the best clients. Most people won’t hire you unless they’re convinced you understand their needs. That’s why pinpointing the underlying reasons driving marketing projects is so important. ABC Company is looking to increase their website traffic by 30% over the next 9 months via a digital marketing campaign. The campaign should feature SEO and PPC initiatives, and should include monthly research and analytics reports. All this problem statement does is regurgitate the client’s project requirements. It doesn’t get to the root problem: why the client needs more online traffic in the first place. As more of ABC Company’s target customers take their shopping online, annual revenue at ABC Company’s brick and mortar stores has decreased this year by 20%. ABC Company needs to focus its efforts on ecommerce in order to reclaim lost market share and align with changing consumer tastes. They can do this by launching a digital marketing campaign featuring SEO and PPC initiatives, along with monthly research and analytics reports. This campaign will increase ABC Company’s website traffic by 30% over the next 9-month period. The persuasive proposal conveys an understanding of the deeper issues (changing consumer behavior and a loss of revenue at brick and mortar locations) that led the client to seek the surface level result (increased online traffic). Many clients won’t even know what their deeper frustrations are… much less be able to articulate them. All they know is their marketing “isn’t working,” and something needs to change. That means it up to you to do some digging. By researching your client’s business, their competitors, and the market – and sharing those insights in your proposal – you send a clear message that you understand the client better than anyone else. Once you’ve identified a client’s core problems, the next step is to propose a marketing solution tailored to solve those problems effectively. This is the point where you recommend a specific set of services to achieve the desired outcome. We recommend a digital marketing strategy utilizing paid Facebook ads and organic search engine traffic, along with a minimum of a 9-month management, research, and analytics program. See the problem here? Their services might be the best for the client, but there’s no explanation why they’re the best. It’s up to the client to “connect the dots” and figure out how they’d be better off. Most of them won’t. We recommend a marketing strategy utilizing paid Facebook ads to drive users to ABC Company’s website. The ROI for similar ads in ABC Company’s niche is 6:1, making them extremely cost effective. We also recommend optimizing ABC Company’s website for high-volume keywords to drive free traffic for months and years to come. A minimum of a 9-month management, research, and analytics program will allow us to assess the strategy’s performance and exploit new opportunities to increase ABC Company’s market share online. Which one sounds more appealing? The answer is obvious: the version where each recommended service ties in with an improvement to the client’s bottom line. The pricing information section (typically called the Fee Summary) is the last critical element in any marketing proposal. For many marketers, it’s also the most intimidating one. But it doesn’t have to be. Clarity is the most important principle to keep in mind. Make it easy for clients to read and understand your pricing information, and you’ll stand out from 99% of your competitors. Because so many marketing projects are long-term, you can use the pricing information section to connect payments to specific milestones. This helps set client expectations about how the process will work (a pricing section like this is usually called the Fee Schedule).Another thing that helps with clarity is keeping your pricing information “high level.” Don’t put a price next to every service you recommend. Your client will thank you if you stick to a single number, like the section above. The three elements above give you a proposal “skeleton” you can then flesh out depending on the target client. This basic structure is effective for every type of service provider because it taps into human psychology. A web designer or SEO expert could use it just like a marketer could. But there are plenty of areas where marketing proposals require special attention. Addressing these subtle topics (when most of your competitors won’t) can mean the difference between consistently winning bids and missing out. Marketing efforts take time to pay off. Experts promising “instant results” succeed mainly by targeting naïve, inexperienced clients. Odds are you’ll need at least a few months to create a significant impact. Your proposal is the perfect place to: 1) give clients a basic idea of your process, and 2) set expectations by letting them know which services will happen when. Marketing projects are more complicated than one-off projects like graphic design. You need an ongoing investment in trust (and money) to succeed. The last thing you want is to have a client hire you, only to flip out a month later because your efforts didn’t meet their oversized expectations. Including a regular reporting element in your services can help persuade clients to give you a chance. Having someone check in regularly about the latest initiatives and progress – and covering this in your proposals – reassures the client and adds a layer of accountability. And more importantly: it gives you opportunities to “re-sell” clients on your services. But have you discussed how closely you’ll be involved in providing that solution? Advisory: develop a marketing strategy, plan campaigns, and set up analytics benchmarks. Then the client handles executing the strategy. Consultative: do everything done in an advisory role plus 1) training the client’s team members individually, and 2) helping execute the strategy in the beginning. Collaborative: handle everything above, along with executing day-to-day activities that put the strategy into action. Some clients (especially those who haven’t hired a marketing expert before) won’t be aware of all the ways you could help them achieve their solution. They might be imagining a different level of involvement from you than the one you have in mind. Your proposal is the perfect place to spell out your involvement and clear up any confusion. This helps prevent scope creep once you start working with a client. Also, you can let the client decide between several levels of involvement. Giving clients options in their proposal increases their likelihood of being accepted. Marketers face a unique challenge in their proposals: defining what “success” looks like and which yardsticks will be used to measure it. A web design project, for instance, is over when the client says they’re happy with “the look” of a website. But that vague measure of success won’t work with marketing clients, who are paying you specifically to improve their bottom line. Many marketing experts submit proposals full of buzzwords and industry jargon. Most clients won’t understand this stuff; some might have a different idea of what those terms mean. Our digital marketing campaign will expand ABC Company’s brand awareness online, cement its reputation as a leader in its niche, and create cost-effective and profitable outcomes. Not exactly riveting stuff. It sounds like it’s straight from a marketing textbook. Even worse: it leaves the idea of what makes your services a failure or success open to interpretation. Our digital marketing campaign will help ABC Company generate leads and sales online by increasing traffic to ABC Company’s website by 30% within the next 9-month period. This sets clear expectations in the client’s mind. It promises specific results both parties can measure to analyze the improvement in the client’s business. The first step to helping dream clients market their businesses? But yours can be different. By focusing on the key elements above – and presenting them in a way that’s structured to persuade – you show clients you understand them better than anyone else. Done well, proposals aren’t obligations. They’re opportunities. It’s time to make the most of yours. We have some great tools available to help you get started. 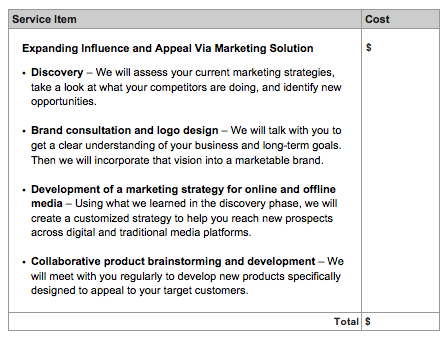 Take advantage of this free marketing proposal template kit. It includes several proposal templates, samples, worksheets, and more. To cut your proposal time in half, you’ll want to use Bidsketch, a proposal creation tool with templates, electronic signatures, and proposal tracking.